The territory of Warmia and Masuria is recognized as one of the areas with the richest fauna in Poland. In additional to common animals, there are many species here which are rare on the national scale, as well as ones declining in numbers and endangered by extinction. 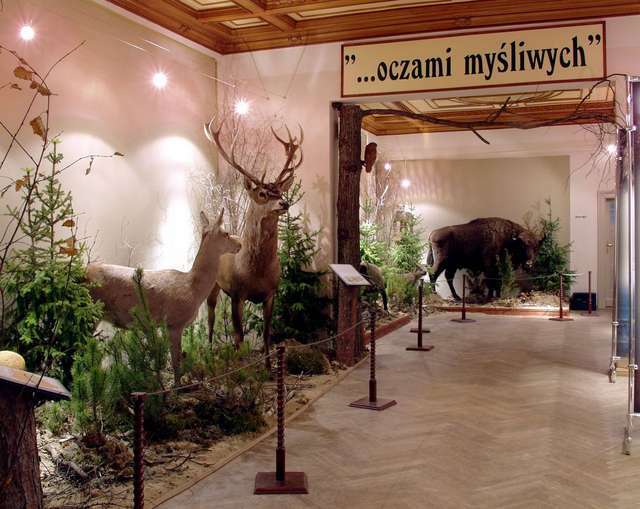 The "Animals of Warmia and Masuria" exhibition gathers over 250 species of animals, from the bison – the largest currently living land mammal of Europe, to small-sized insects. At the exhibition you may see, among others, the tiny shrews, magnificent eagles, the already perishing roller, pond turtle, the two-metre catfish, as well as many other interesting representatives of our fauna. The exhibition is supplemented with colourful photograms presenting different types of habitats where the presented animals occur.